Kitchen remodeling in Stanton CA can be a big investment. It’s important to trust your investment to a true professional like Cabinet Magic. With Cabinet Magic on the job, you can rest assured every aspect of your project will be handled to the very highest standard. This includes not only the typical contractor work of construction and installation, but also help finalizing your design and finding the right products and materials. 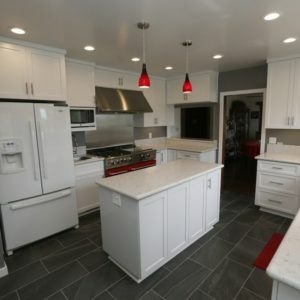 Whenever you do kitchen remodeling in Stanton CA, you run into the challenge of making design decisions based off of product samples rather than the real thing. This can be problematic. After all, samples can look quite different in your hand than installed in your kitchen. At Cabinet Magic, we never want our clients to feel worried that they’ll be anything less than thrilled with their kitchen remodeling in Stanton CA. That’s why we use computer rendering software to create detailed 3D images showing what the finished remodel will look like. By giving clients a “preview” of the finished job, we offer an opportunity to make any necessary design changes before work begins. Custom cabinetry really is a must for any high-end kitchen remodel. At Cabinet Magic, we can create the exact cabinets you want right here in our La Habra CA factory. We offer a complete range of styles from modern to traditional, along with virtually any color of paint or stain you could want. We even offer custom crown molding for cabinets. Our cabinets are sturdily built to stand the test of time and incorporate high end features like soft-close hidden hinges and smooth drawer slides that make them a pleasure to use. Take the first step towards beginning your kitchen remodeling in Stanton CA today by contacting Cabinet Magic at 800-828-4380 and requesting your free in home consultation. We’ll go over your wish list with you and provide an estimate for the necessary remodeling work.